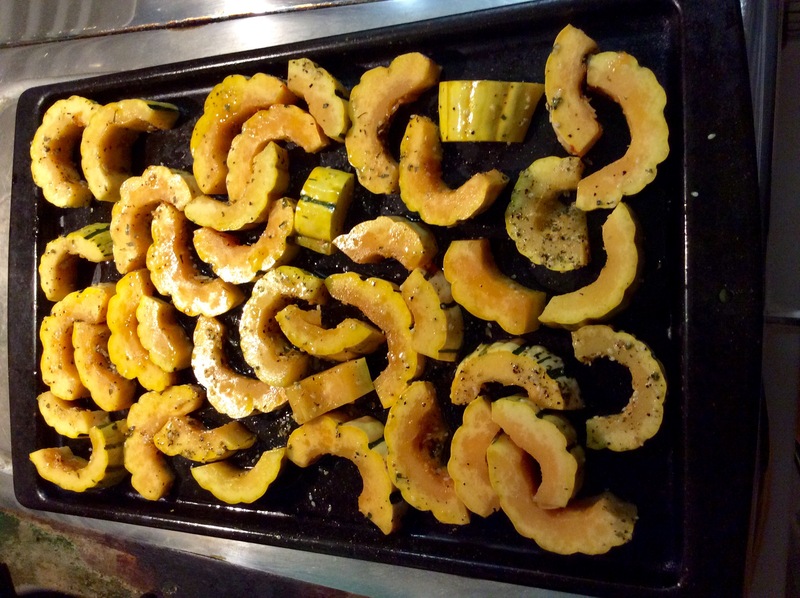 Baked Delicata Squash- adult candy! One of the easiest and most delicious low carb side dishes; and it’s easy to prepare as well. 2. Split the squash lengthwise and scoop out the seeds and pulp. 3. Rub the insides with olive oil and herbs and seasonings. 4. 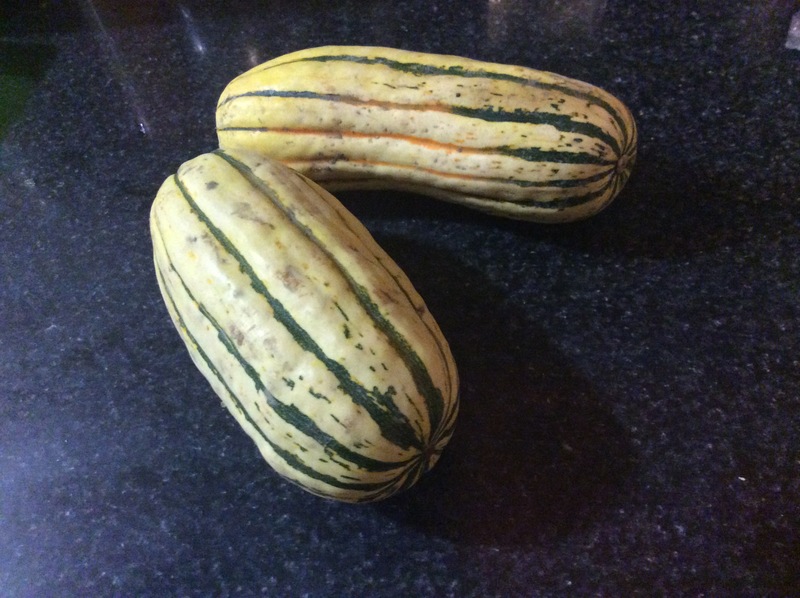 Slice the half squashes into 1/2 inch “moons” – see the photo above. 5. Rub oil on a baking sheet – put slices pulp face down; make sure each piece is separate on the pan. 6. Bake for 20 minutes – turn pieces over and bake another 25 minutes until soft and brown on both sides. Raw ingredients – lots of good stuff! So good, pretty and easy! Take a mix of colored raw winter vegetables; your choice; (I’m sharing our latest mix- but almost any root veggies that you like will be fine for this). I like to include vegetables that aren’t so common such as white turnips, parsnips and kohlrabi, as well as the old standards like carrots, onions and beets. Sometimes I also add fennel and delicata squash. I made a large mix of these for our Christmas Eve family dinner – it was the highlight of the meal; (even though we had also had roast turkey, leg of lamb, sweet potatoes, green beans and salad)! A non-holiday suggestion is serve with roast chicken and the always good green salad– so delicious and healthy! 2. Scrub all vegetable; cutting off ends and any bad spots. Only peel Kohlrabi; other veggies are cooked unpeeled. 3. 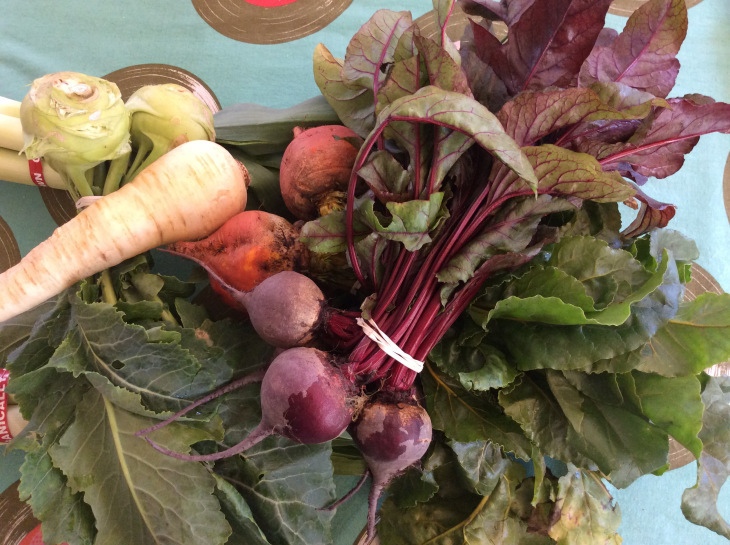 Cut beets, kohlrabi, turnips and onions in 1/2. Cut carrots and parsnips in 1/2 lengthwise. Mix in a bowl with olive oil and seasonings. 4. Lay all cut veggies on one layer (each piece touching the pan) face down on oiled baking sheet and bake for 45-50 minutes until tender. 5. 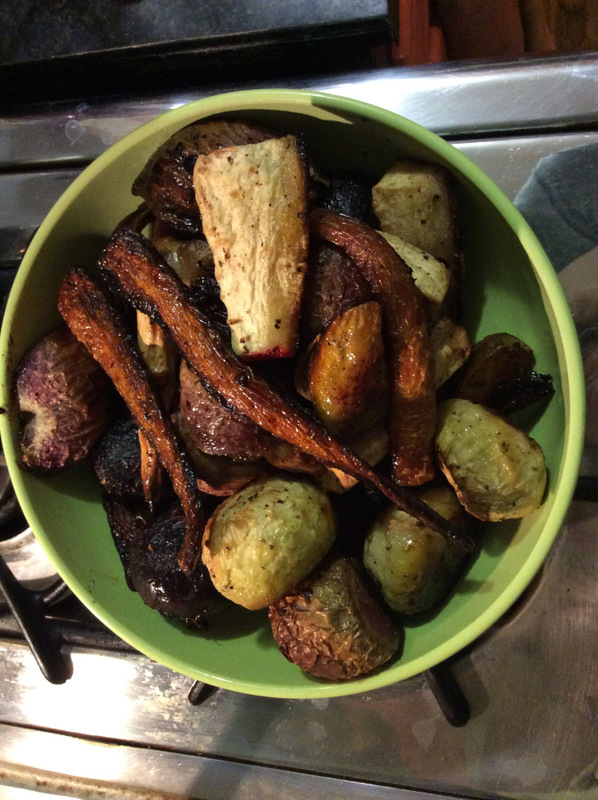 You can then turn off the oven and let vegetables roast on their own for at least another 1/2 hour — they become carmelized and sweet- melt in the mouth! 7. Add more seasonings and salt if you like.